Sufferers of hypersensitivity to common antibiotics like penicillin and amoxicillin will soon find help with a new allergy detector, a low-cost, bio-photonic device that will be 6 times faster and 100 times more efficient than current technology, providing more targeted treatment for millions of patients. Over 2.5 million people in Europe and more than 5.4 million Americans suffer from hypersensitivity to Beta Lactam Antibiotics (BLCs), the most commonly prescribed drugs that contain the penicillin family, with up to 10 percent of people reporting an allergy. Despite its effectiveness, many people avoid penicillin and its relatives fearing a severe allergic reaction, where symptoms can include wheezing, coughing, breathing problems, tissue swelling, or in some serious cases anaphylaxis, requiring urgent medical attention. Currently, anaphylaxis leads to 500–1,000 deaths per year in the United States, 20 deaths per year in the United Kingdom, and 15 deaths per year in Australia. It is thought that drugs may be accountable for as many as 1 in 2 anaphylactic deaths. With existing in-vitro allergy detection technology delivering a waiting time of over 3 hours and a cost of €30 per allergen, a team of European researchers running the Horizon 2020 project COBIOPHAD (‘Compact Biophotonic Platform for Drug Allergy Diagnosis’), aim to improve this with their scanning device employing the latest photonics technology. Similar in size to a small notebook computer, the detector, which could be used in hospitals in as little as five years, examines a tiny plasma sample from the patient’s blood, producing a result in less than 30 minutes and at a cost of €2.40 per allergen, a twelfth of the current price. It works by ‘reading’ a compact disc-like cartridge with a laser, similar to the way an everyday CD ROM drive in your computer works. 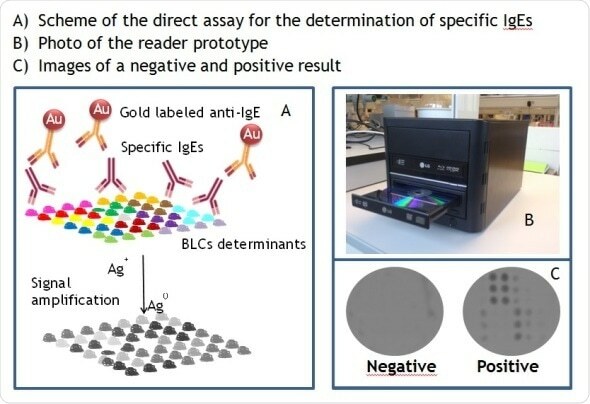 The cartridge contains pre-loaded Beta Lactam reagents which will recognise a specific Immunoglobulin E (IgE), (the antibody contained in blood that plays a vital part in manifestation of allergy), and a secondary tracer antibody. When the patient’s blood sample is run across the cartridge, if there is a positive response the lgE will recognise the antibiotic and the laser will read the reaction product, leading to an unambiguous detection. The intensity of this signal is related to the levels of hypersensitivity within the patient for ten different targeted Beta Lactams. The COBIOPHAD device aims to take drug hypersensitivity detection into a new era: compared to current tests our device can deliver a rapid diagnosis of the main allergenic BLCs in less than half an hour, making it 6 times faster. With an improved in vitro diagnostic (IVD), we offer a much more patient-friendly alternative to the invasive and risky in vivo testing. Current IVDs, developed with bulky auto-analysers and based on classical technologies, show poor sensitivity (less than 40%) and detection limits (more than 0.2 kU per litre), analyse only five beta-lactam antibiotics and give false-positive and negative results. The COBIOPHAD approach must reach a sensitivity of 80% with a detection limit below 0.1 kU per litre. It deploys an increased multiplexing capability, looking at more samples per disc and examines a greater number of BLCs per sample. As a result the overall system is a hundred times more efficient. With savings of €27.60 per patient amounting to a colossal €69 million per year from European sufferers, and by significantly reducing the costs from additional hospitalization from allergic reactions to certain drugs creating potential savings in this area of up to €4500 per patient, the COBIOPHAD team have large scale ambitions.